D-FORCE HPX made by Waterbury was recently purchased by FMC Corp. and is now manufacturered by FMC under the name D-FORCE Insecticide. Same active ingredient, but with a new look. D-Force Insecticide has the power of Deltamethrin for above ground termite control, bedbugs, plus 50 other insects. D-Force Insecticide provides 100% control of crawling insects for up to 8 weeks in a 14 oz. aerosol can. D-Force is a ready-to-use, pressurized (aerosol) insecticide with the active ingredient Deltamethrin. Deltamethrin is a synthetic pyrethroid that kills by acting as a high-power poison to the insect's central nervous system. Once poisoned, the insect’s nerve cells become excited, causing paralysis and eventual death. D-Force is designed to kill insects either by direct spray or by contact with the dry residual for up to 8 weeks after application. Ants, Bees, Bedbugs, Carpet Beetles, Centipedes, Cockroaches, Crickets, Firebrats, Fleas, Flour Beetles, Grain Beetles, Ground Beetles, Gnats, Midges, Mole Crickets, Moths, Pillbugs, Silverfish, Sowbugs, Spiders, Ticks and Many Other Crawling Insects, Carpenter Ants and Carpenter Bees. D-Force Insecticide is a convenient, ready-to-use product with the same active ingredient as the popular Suspend SC insecticide concentrate. D-Force treats the most common household crawling and flying insect pests, including ants, cockroaches, spiders, silverfish, pantry pests, bed bugs, carpenter bees, swarming termites, and many more. The convenience of an aerosol is ideal for small areas, such as apartments, or for detailed treatments such as cracks and crevices. D-Force can be used in a variety of areas, including residential and commercial buildings and food-handling establishments. Use indoors as a spot or crack and crevice treatment, or outdoors for perimeter pests, as a spot treatment, or for surface applications for flying or crawling pests. D-Force should not be used as a broadcast treatment or as a substitute for insecticide concentrates when treating large areas. This has residual action which keeps on killing for up to 8 weeks after you spray. Remove pets, birds and cover fish aquariums before spraying. Hold container upright. Do not spray up into air. Remove protective cap and direct spray away from face. Hold can 12-15 inches from surface being sprayed. Press button down and spray as directed. Spray surface until slightly wet. For control of all labeled pests, applications are permitted in food/feed and non-food/non-feed areas of food/feed handling and processing establishments as a general surface, spot or crack and crevice treatment. *1 second spray per spot. This product is authorized for use in Federally Inspected Meat and Poultry Plants as a crack and crevice treatment. Do not use in commercial food/feed handling establishments, restaurants, or other commercial establishments while food is commercially prepared, processed, or served. In the home, all food processing surfaces should be covered during treatment or thoroughly washed before use. Exposed food/feed should be covered or removed. Food/Feed handling establishments are defined as places other than private residences in which exposed food/feed is held, processed, prepared or served. Included also are areas for receiving, storing, packing (canning, bottling, wrapping, boxing), preparing, edible waste storage and enclosed processing systems (mills, dairies, edible oils, syrups) of food/feed. Serving areas where food/feed is exposed and the facility is in operation are also considered food/feed areas. Examples of non-food/non-feed areas include garbage rooms, lavatories, floor drains (to sewers), entries and vestibules, offices, locker rooms, machine rooms, boiler rooms, mop closets and storage (after packaging, canning or bottling). All areas that insects inhabit or through which insects may enter should be treated. Except in federally inspected meat and poultry plants, spot or crack and crevice applications may be made while the facility is in operation provided exposed food is covered or removed from area being treated prior to application. Because this is a ready-to-use product, yield will vary depending on application. For pests that require multiple treatments, such as bed bugs, many users require one can per room being treated. Other treatments: Hold can 12-15 inches from surface being treated. Spray surface until slightly damp. Do not overtreat. Food Handling Establishments, Including Food Service, Manufacturing and Processing Establishments, Such as Restaurants, Cafeterias, Supermarkets, Bakeries, Breweries, Dairies, Meat, Poultry & Egg Processing & Packaging Plants, Canneries, Feed Handling Establishments Including Feed Manufacturing and Processing Establishments. Also For Use In Homes, Tents, Aircraft, Apartments, Atriums, Attics, Automobiles, Basements, Bathrooms, Boats, Bottling facilities, Buses, Cabins, Campers, Candy Plants, Carports, Cat Sleeping Quarters, Clothes Storage, Condominiums, Decks, Dens, Driveways, Garages, Gazebos, Granaries & Grain Mills, Hospitals, Hotels, Industrial Buildings, Kitchens, Laboratories, Lanais, Living Rooms, Mausoleums, Offices, Parlors, Patios, Pet Sleeping Areas, Play Rooms, Porches, Railcars, Recreational Vehicles, Rooms, Schools, Ships & Vessels, Solariums, Storage Areas, Sun Rooms, Trailers, Trucks, Utility Rooms, Verandahs, Warehouses and Wineries. Cockroaches (including adult and immature stages of both non-resistant and organophosphate and carbamate resistant strains), ants, booklice, boxelder bugs, centipedes, crickets, dermestids, firebrats, fleas palmetto bugs, silverfish, sowbugs, ticks and waterbugs: Apply thoroughly to all areas where these pests crawl and hide, especially in cracks and crevices, and hidden areas around sinks and storage areas, behind baseboards, around doors and windows, behind and under refrigerators, cabinets, sinks and stoves, the underside of shelves, drawers, bookcases, and similar areas. When pests are driven out, spray directly. Ants: Spray freely around ant trails, doors and windows and other places where ants enter the house. Fleas and ticks on surfaces: Remove pet bedding and destroy or clean thoroughly. Spray pet resting quarters. Adult fleas and larvae contacted by spray will be killed. Put fresh bedding down once spray has dried. Do not spray animals directly. For best results, pets should be treated with an appropriate before returning to the treated area. Spray rugs and carpets when infestations are bad. Test first for staining on an inconspicuous piece prior to use. Bedbugs: Remove linens and wash before reuse. Apply to mattresses, especially tufts, folds, and edges until moist. Apply to the interior of the frame. Allow to dry before remaking bed. Treat baseboards, molding and spot treat floors. Not recommended as the sole treatment for bed bugs. Spiders: Apply along and behind baseboards, to window and door frames, corners, pipes, storage localities, attics, crawl spaces and other areas over which these pests may crawl. Centipedes, Ground Beetles, Pillbugs, Sowbugs and Ticks: Apply around doors and windows and other places where these pests may enter premises. Treat baseboards, storage areas and other locations where these pests are found. WOOD INFESTING INSECTS: Termites* (Subterranean, Formosan and Drywood)- For control of above-ground termites in localized areas, apply to voids and galleries in damaged wood, and in spaces between wooden structural members and between the sill plate and foundation where wood is vulnerable. Applications may be made to inaccessible areas by drilling, and then injecting with the supplied void injector into the damaged wood or wall voids. These applications are not a substitute for mechanical alteration, soil treatment or foundation treatment but merely a supplement for controlling active infestations of subterranean termites. Termite carton nests in building voids may be injected using a void injector. It is desirable to physically remove carton nest material from building voids when such nests are found. This type of application is intended to be a supplemental treatment for control of drywood and above-ground subterranean termites and other wood-infesting insects. Application to attics, crawl spaces, unfinished basements, or manmade voids may be sprayed to control exposed worker and winged reproductive forms of termites. For control of swarming or reproductive stages of termites, spray to the swarm or area on which they collect. The purpose of such applications of this product is to kill workers or winged reproductive forms which may be present at the time of treatment. Such applications are not a substitute for mechanical alteration, soil treatment or foundation treatment but are merely a supplement. This product is not recommended as sole protection against termites. For active indoor termite infestations, get a professional inspection. Carpenter Ants: For effective control in houses and other structures, apply as general surface, spot, crack and crevice or wall void application. Apply around doors and windows and other places where ants may enter the premises and where they crawl and hide. Spray into cracks and crevices or through small drilled holes into voids where these ants or their nests are present. For control of carpenter bees in structures, spray the liquid directly into gallery entrance holes. Following treatment, the entrance holes may be left open 24 hours to be certain that returning adult bees are killed. When there is no activity, the hole may be sealed with a suitable sealant. Point nozzle away from face. Hold can in a slight downward angle, approximately 12-15 inches from surface to be sprayed. For best results, spray when air is calm. Spray with wind if breeze is blowing. Perimeter Treatment: For control of building infestation to ants, clover mites, crickets and sowbugs (pillbugs). Spray foundation of building where insects are active and may find entrance up to a height of 2 to 3 feet. Apply as a residual spray to outside surfaces of buildings where insects tend to congregate. Spray areas include areas such as screens, window frames, eaves, porches, patios, garages and refuse dumps. Crawling Insects: Ants, Cockroaches, (including Asian Cockroaches), Centipedes, Crickets, Mole Crickets and Silverfish. Spray infested surface of patio or picnic area, hitting as many insects as possible. Also spray legs of tables and chairs to repel ants. Ants: Apply to ant trails, around doors and windows and other places where ants maybe found. Lone Star Ticks, Dog Ticks, Crickets, Fleas and Earwigs: Apply thoroughly to infestation in bushes, grass or weeds. Wasps, Mud Daubers, Hornets and Bees: Spray nests and bees directly. D-Force is not a knockdown agent, so insects will not die immediately. Flying Insects: Houseflies, Gnats, Mosquitoes and Small Flying Moths: Use only on outdoor surfaces. Spray outside surfaces of window and door frames and other areas where these pests may enter the home. Also spray localized resting areas, such as under eaves, porches, light fixtures and cords, railings, etc. where these insects may rest. Insects coming to rest on treated surfaces will be killed. Termites: For control of above-ground termites inside trees, utility poles, fencing and decking materials and similar structural members, drill to find the interior infested cavity and spray using void injector. Termite carton nests in trees may be spray injected with product using the supplied void injector. Multiple injection points to varying depths may be necessary. It is desirable to physically remove carton nest material from trees when such nests are found. Protects up to 8 weeks. Keep children and pets out of treatment area until product has dried. Not recommended as the sole treatment for listed pests such as bed bugs and termites. If using in conjunction with a baiting program, such as for ants or roaches, do not apply spray on top of baits or in areas where baits may be applied. Do not use a broadcast spray indoors or outdoors away from structures except as directed. Do not apply directly to clothing for webbing clothes moths, bed bugs, or other pests. Use the crack and crevice straw for detailed applications such as bed bug treatment. When treating outdoors, spray when air is calm. 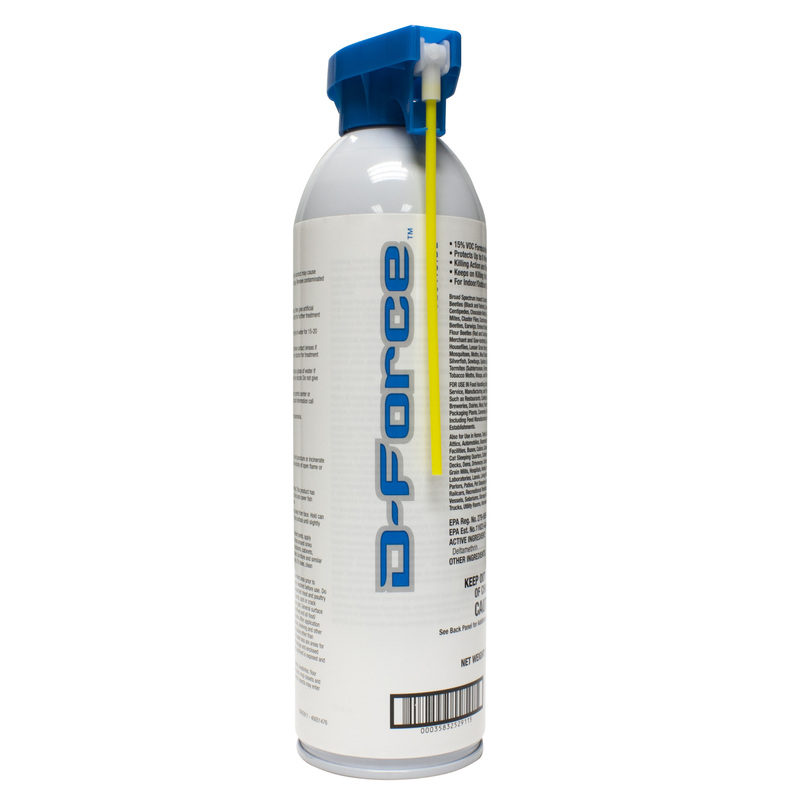 D-Force has a slight odor that will dissipate after application. D-Force is not a knockdown agent, so insects sprayed directly will not die immediately. I encountered a bed bug infestation when I just started renting an apartment. I used D-Force HPX and to my surprise we were able to completely eliminate our problem. But you need to follow treatment every 10 days. Vacuum under the bed, sofa and mattress. Spray around the mattress, bed frames and carpet. We did not have to throw out any furniture. If you have a bedbug problem, D-Force HPX really works. It kills them instantly. I recommend this product to any one with bed bugs along with Drione Dust and Gentrol. Use these three products together and you will be bug free within 6 weeks not to mention it won't break the piggy bank like an exterminator would. I am trying to get rid of bedbugs. I used D-Force HPX over 3 months ago and it really worked and I wanted to keep up this method. I'm telling you folks, this product works! I had a suspicion of bed bugs (there were random marks showing up on my skin in patterns...) and after reading other reviews purchased this product. Aside from the smell, which I recommend you vacate your place for at least 3 hours after dispersing, this product is certainly a miracle worker. Also, you can't beat the free shipping and speedy delivery! We've used D-Force HPX on just about everything. Our cricket problem is no longer a problem, and our ants don't seem to like that we keep this stuff stocked. Oh, and just so you know this stuff will take a wasp right out of flight. Love it. Is D-Force safe to use around pets? Once the product dries, will it pose any risk to my dog? Yes D-Force is safe to use around pets as long as you follow the product label. Pets and people need to be out of the room while the product is being applied and can safely return as soon as it is dry. 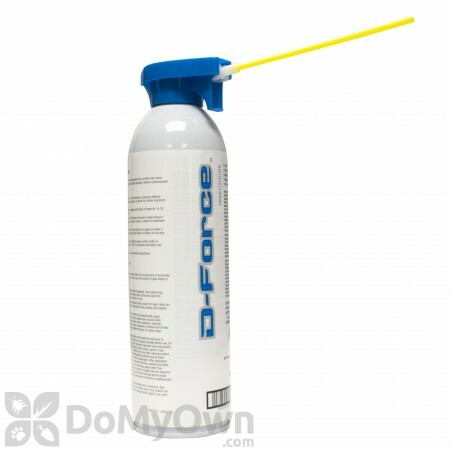 What is the best way to use D-Force HPX Aerosol for bed bug control? We live in an apartment building where many tenants seem to have a bedbug problem. Some have even been found in the laundry room. After eliminating the initial infestation, should we use D-Force again to prevent re infestation, and if so, how soon and/or often? We actually found two adults in our search with no visible excrement and no visible eggs after a thorough search of box springs, drawers and closets. Do you think it is necessary to do the whole apartment or will doing the bedroom suffice? If you were to use one product for prevention and/or treatment of bed bugs, then we would recommend Bedlam. It is our most popular product and it will kill adult bed bugs as well as bed bug eggs. D-Force will not kill bed bug eggs, and there is a concern of bed bugs becoming resistant to D-Force. If you have only found bed bugs in your bedroom then it would probably be OK to only treat that room, but if bed bugs were found all over different areas of the buildings, then you should treat the whole unit for adequate protection. Also, if you have been sleeping on a couch instead of your room then you would want to treat the whole apartment. You should use one of our Bed Bug Kits for optimal results. Can I spray D-Force HPX in my kitchen drawers and cabinets? D-Force HPX can be sprayed directly into cracks and crevices under and behind kitchen drawers and cabinets. How do you get rid of flying ants? For the past two weeks I have been finding dead flying ants in my kitchen and bathroom. I live in a condo with an attic, I have searched but cannot find the colony, what do you recommend to get rid of them? First off you should make sure they are definitely swarming ants and not swarming termites, which are sometimes confused with swarming ants. If they are ants, then it is very hard to get rid of the problem until they stop swarming on their own unless you know where they are getting in. You can treat all baseboards, cracks and crevices, window sills, and other areas with a residual aerosol to try to kill the ants as they are entering the bathrooms, but other than that there are not many options if you have no idea where they are getting in. 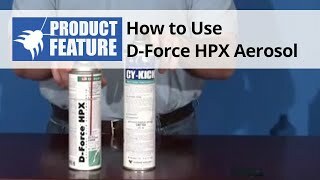 We would recommend D-Force HPX Aerosol to use around the baseboards and other areas. I have found 3 bugs that look like carpet beetles in my house. Should I be concerned? Should I take action? I found them in my bedroom. Is there anything that I should be doing?